An inclusive classroom begins with an inclusive syllabus. Although we include information for creating a syllabus on our preparing a course page, we also believe that it is important to include resources specifically for instructors who wish to create an inclusive classroom climate and acknowledge issues related to diversity, equity, and inclusion (DEI) in their syllabi. This page begins with a statement produced by Ward Lyles and the Urban Planning department for the CTE 2016/2017 Diversity Scholars Program. After reading this letter, we encourage you to consult the many resources on this page as you draft a syllabus that recognizes and embraces diversity. Creating an inclusive and equitable climate for learning in diverse classrooms is an important but often overlooked aspect of developing a syllabus and conducting a successful course. In the winter of 2016-2017, the Urban Planning department used a grant from the Center for Teaching Excellence to consolidate and extend existing resources to create an easy-to-use tool for self-evaluating our teaching when it comes to diversity, equity, and inclusion. This packet introduces the tool and explains how it can be used to advance equity, diversity, and inclusion in our courses, especially through a self-audit of our syllabi. Diversity is understood to be intellectual, practical, and personal engagement with issues related to social justice and equity, particularly in relation to minority and marginalized groups such as African Americans, Latinx, Native Americans, international peoples, women, people with disabilities, and members of the LGBTQIA+ community. Equity is understood to consist of a safe, healthy, and fair learning environment for all students. Inclusion is understood to consist of fully involving and engaging all students in the community of learners in a classroom. When considering issues of diversity, equity, and inclusion in terms of how they manifest in higher-education settings, some groups, including students of color, non-traditional students, first generation students, working students, parents, and older students are often especially marginalized. Moreover, individuals can experience social categories such as race, class, and gender as overlapping and interdependent factors of discrimination or disadvantage, a phenomenon understood as intersectionality. All instructors can take steps to recognize the diverse experiences their students live and to make their classrooms more inclusive and equitable. To improve course syllabi and make our university more inclusive to all students. We hope and expect that the tool will evolve over time as more instructors use it. We welcome your feedback and suggestions. PLEASE LOOK AT THE PROMPTS BELOW AND CONSIDER YOUR OWN SYLLABI AND TEACHING TO DETERMINE WHAT LEVEL (0, 1, 2, OR 3) MOST ACCURATELY REFLECTS YOUR SITUATION. THE LEVELS ARE DESIGNED TO HELP YOU MAKE EFFECTIVE CHANGES MOVING FORWARD. LEVEL 0- Establish a baseline. Information on accommodations for schedule conflicts and religious holidays. Information on accommodations for disabled students and how to contact the AAAC. LEVEL 1- Perform a self-assessment. Critically read your syllabus and note if and where you address issues of diversity, equity, and inclusion. Understanding where your syllabus is lacking in coverage of these issues can help inform the improvements you choose to make in Levels 2 and 3. The first and easiest change to make to your syllabus is adding information about campus resources available to students. See CHECKLIST OF RESOURCES for a list of pre-formatted descriptions of resources to paste directly into your syllabus. LEVEL 2- Make improvements to course descriptions. The next level of improving your course involves reviewing the descriptive sections (the introduction, objectives, course format, policies, etc.) of your syllabus and focusing on how the course climate you create and the pedagogy you use does or does not address issues of equity, diversity, and inclusion. While this level requires more consideration on the part of the professor than Level 1, it also makes a greater impact on student’s understanding of how these issues will be addressed in the course. See CHECKLIST OF ACTIONS for detailed examples of how to engage issues of diversity, inclusion, and equity – to the benefit of all students – in the realms of class climate and class pedagogy. LEVEL 3- Make improvements to fundamental course elements. More substantial changes can be made to fundamental course elements such as the module topics, lecture topics, and course readings to integrate issues of diversity, equity, and inclusion into a classroom setting. These changes may require a restructuring of the course, but the resulting changes will actively engage students in developing and furthering their understanding of these issues. Here too, CHECKLIST OF ACTIONS provides numerous ideas for addressing diversity, equity, and inclusion through course content. KU Counseling and Psychological Services (CAPS) – CAPS can help students with issues related to adjusting to college and other psychological, interpersonal, and family problems. Individual and group sessions are available. You can find more information at https://caps.ku.edu/. Phone is 785-864-2277 and hours are M, W, F 8-5 and T, H 8-6. CAPS is located in Watkins Memorial Health Center. KU Office of Multicultural Affairs (OMA) – OMA provides direction and services for current and prospective students from underrepresented populations. In addition, through collaborative partnerships it offers diversity education programs that foster inclusive learning environments for all students. OMA’s programs and services enhance the retention of successful matriculation of students, while supporting their academic and personal development. You can find more information at:https://oma.ku.edu/about Phone is 785-864-4350. OMA is located in the Sabatini Multicultural Resources Center next to the Union. KU Academic Access and Achievement Center (AAAC) – AAAC offers many services and programs to assist students in their academic success and to enhance their collegiate experience at KU. Choose from learning strategy consultations, group workshops or general or course-specific academic assistance, by appointment or on a walk-in basis. Feel free to talk with AAAC and ask for information or direction about academic and personal issues. You can find more information at: https://achievement.ku.edu/. Phone is 785-864-4064. The AAAC is located in Rm 22 Strong Hall. KU Public Safety – Public safety is dedicated to providing a safe and secure environment for the thousands of students, faculty, staff and visitors that are on campus each day. Public Safety’s website contains practical information that can protect you from becoming a victim of a crime, help you recognize and report suspicious activity, and guide you in the event of an emergency. KU Emily Taylor Center for Women & Gender Equity (ETC) – The ETC provides leadership and advocacy in promoting gender equity and challenge gender-related barriers that impede full access, inclusion, and success. The ETC provides services, assistance, advocacy and support to campus community members of all genders. We also provide consultation, information and resources to Edwards and KUMC campus members, parents of KU students and the community by request. Appointments are recommended, but not necessary. Services are private. In situations involving discrimination and violations of Title IX, ETC staff report information to campus authorities. Center programs and facilities are also accessible to individuals with disabilities. For those requesting accommodations, please contact KU Student Access Services at 785-864-4064 or achieve@ku.edu. The ETC is located in 4024 Wescoe Hall. KU Writing Center - The Writing Center offers a variety of ways for students and members of the community to get feedback on their writing. It offers face-to-face consultations, online appointments, and an eTutoring appointments. Information regarding each type of appointment and a tool for scheduling can be found at http://writing.ku.edu/. The Writing Center has multiple locations on campus. KU Student Involvement & Leadership Center (SILC) – SILC prepares students to become contributing members of society by providing meaningful co-curricular experiences. SILC is responsible for coordinating registered university organizations and providing leadership education experiences for students in addition to providing programs and services to specific target populations including fraternity/sorority members, non-traditional students, and students of all gender identities, gender expressions and sexual orientations. More information can be found at https://silc.ku.edu/. A notable program of SILC is the Safe Zone Training, which aims to reduce homophobia, transphobia, and heterosexism on our campus to make KU a safer and freer environment for all members of our community, regardless of sexual orientation, gender identity, or gender expression. By agreeing to become a Safe Zone ally, the participant agrees to undergo training and to serve as a resource for people seeking clarification on issues of sexuality and gender diversity. SILC is located in the Sabatini Multicultural Resources Center. Sexual Assault CARE Coordinator - Watkins Health Services provides support to victims of sexual and domestic violence. Merrill Evans, LSCSW, is our CARE (Campus Assistance, Resource, and Education) Coordinator whose primary role is to coordinate support for individuals (both victim and alleged perpetrators) impacted by sexual violence including incidents of sexual assault, sexual battery, partner violence, dating violence and stalking. The CARE Coordinator is a confidential position and is not required to report incidents to University officials or organizations. If you or someone you know has been affected by any form of sexual violence, please do not hesitate to contact Merrill or stop by Watkins Health Center Room 2615 during normal business hours. If WHS is closed, the Sexual Trauma & Abuse Care Center is available 24 hours for victim assistance at 785-843-8985. Sexual Assault Prevention and Education Center (SAPEC) - SAPEC promotes social change and the elimination of sexual violence through prevention education, inclusive programming, and campus-wide collaboration. SAPEC is located at 116 Carruth O’Leary; Phone 785-864-5879; email: sapec@ku.edu; http://sapec.ku.edu/. Institute of Institutional Opportunity & Access (IOA) - The Office of Institutional Opportunity and Access (IOA) is responsible for administering the University of Kansas equal opportunity and non-discrimination policies and procedures, as well as, encouraging a campus climate of respect and understanding of all aspects of the human experience. To accomplish these duties, the IOA offers assistance and protective measures to students, faculty, and staff who report acts of harassment, discrimination, sexual misconduct, sexual violence, and retaliation; provides information about health, safety, advocacy, and support resources for members of the Lawrence and Edwards campuses; performs formal investigations to detect, discontinue, and prevent violations of the Non-Discrimination Policy and Sexual Harassment Policy; and ensures University compliance with state and federal civil rights laws. IOA is located at 153A Carruth-O’Leary; Phone 785-864-6414; email: ioa@ku.edu; http://ioa.ku.edu/. Below is a checklist of actions instructors can take to address diversity, inclusion, and equity in their courses, particularly in their syllabi. They are organized within categories of course climate, course pedagogy, and course content. These items are drawn from the work of Kim Case, Shari Suanders, Diana Kardia, and others. Express to your students that you are interested in getting to know them. Who are they? Where do they come from? Why are they in your class? What background experiences do they have? Clearly indicate your availability for consultation outside of class to students by including contact information, office hours, and a welcoming statement in syllabi; many students from marginalized groups assume they should not bother instructors. Make the syllabi visually appealing to engage students, but also check to ensure that any images or graphics that are used are visible to all students (e.g., tag images with verbal descriptions for visually impaired students and avoid color schemes that are difficult for colorblind students to discern). Add a personal touch to the syllabus to let students know that you are human and approachable; for students who feel less welcome at a university, such statements can make instructors seem more accessible and approachable. students from certain groups are more likely to have any particular personality characteristic, approach to conflict, political views, or otherwise stereotypical characteristic. Create a class climate in which students feel comfortable critiquing the instruction, including the selection of topics, materials, and pedagogy. Part of creating an open climate begins with the instructor’s attitude and statements early in the semester. An open climate can be reinforced through structured activities used at strategic points in the semester, such as around the midterm, to solicit feedback on things the instructor and students alike can do to improve learning. Such activities can increase trust in the classroom, as well as improve student learning and student perceptions of instructional quality. When drawing on cultural references and analogies, be aware of your own limited awareness as an instructor. Whether because of generational, cultural, or other differences, students may have very different cultural reference points that you should be sensitive to. Avoid using exclusive examples, such as football or hockey analogies, sports that tend to be heavily dominated by men, or referring to a situation or joke from a show like Seinfeld, Friends, Leave it to Beaver or other show with a white-dominated cast and audience. Check use of syllabi terminology; avoid general use of male pronouns and avoid cultural phrasing that does not translate from English easily (e.g. avoid idioms like ‘assignment will not be a piece of cake’). Develop guidelines/ground rules for course discussions with student participation. If this cannot be done, at least provide guidelines in the syllabus. Points to emphasize can include: engaging in respectful disagreement without attacking individuals; sharing discussion time with peers so that a few students do not dominate; making clear that no student speaks for all other people who share a characteristic with them; and having the courage to learn even when we are uncomfortable. Include a statement about preferred names/pronouns. Transgender, gender diverse, and students in general will know that their identities will be respected in the classroom. If, as instructor, you are unclear or nervous about how to address issues of sexuality and gender diversity, consider taking the Safe Zone Training offered through SILC. Consider the costs of textbooks when creating reading lists; textbooks can cost a month or more worth of rent each semester for some students. If possible, assign texts that have used or online copies available. Aim to have required textbooks be the book(s) that students will benefit from having on their personal or professional shelves in future scholastic years and/or after graduation. Make course due dates, especially for graded work, clear and avoid major changes at all costs. Marginalized students, especially those who also have substantial work or family responsibilities, are especially inconvenienced or hurt by unexpected changes in schedules. Consult with students about the best days of the week and times of day for deadlines. Make late policies clear. Avoid religious holidays for due dates or especially important class periods. Be cognizant of technology expectations to succeed in class. Not all students can afford laptops, printers, smartphones, specialized software, or even color printing. If learning requires one or more of these more expensive tools, make sure students can feel comfortable approaching you to find accommodations. Make attendance policies and expectations clear. In courses that take advantage of in-class, active learning pedagogies, make clear that attendance is truly mandatory because groups/teams cannot function when members are absent. Pay attention to grouping students for learning. There is no one right strategy for group formation because course settings and student characteristics vary so widely. For each class and for each group assignment consider which combination of individual characteristics will create the best learning environments and then transparently create groups to ensure balance across teams. Also, where possible, avoid groups that end up with only one student from a marginalized population (e.g. five teams with each team having five men and one women; instead have a couple of teams with multiple women and a couple with none). For group assignments, consider having designated roles for group members (e.g. reporter, moderator, etc.) and rotate roles over time. Students from marginalized groups may be reluctant to take more active roles because of stereotype threat or may even be actively excluded by students from dominant groups. Minimize out-of-class group collaboration that requires in person meetings between students. Students from marginalized backgrounds, especially those with major financial or family responsibilities, may have more constraints on their schedules. Be open to departing from a planned activity or topic if an important discussion unfolds unexpectedly. These unstructured and unanticipated discussions can build trust and provide surprisingly relevant ways to understand course material in a new light. Invite all students to participate in discussion, but do so tactfully without putting students on the spot. Sometimes simply catching a student’s eye, holding contact for an extra second, and raising an eyebrow can gently entice a student to jump in who may be reluctant to put up a hand or might feel under pressure if called on by name. Be ready to handle conflict. Students will disagree, sometimes heatedly. If you are uncomfortable in the role of facilitator, seek out training from CTE, OMA, or other entities on or beyond campus. You can learn how to better recognize students’ fears and concerns, how to be firm but respectful in disagreeing or pointing out how a comment is hurtful, how to model “I” statements, and other techniques from the wide literature on conflict resolution. Do so very carefully and thoughtfully, however, because not all students will receive feedback in the same manner; for example, some students may have been subjected previously to unfair or harsh criticism and be especially vulnerable to micro-aggressions. If instructors cannot be brave in entering into difficult conversations, however, our students will likely not be either. Include a clear statement of your teaching philosophy in your syllabi, particularly how it addresses issue of diversity, inclusion, and overall engagement. Make the course description in the syllabus clear and free of academic jargon, particularly for non-technical courses open to all majors; also clarify any prerequisite courses needed. Clearly articulate overall learning goals and specific learning objectives, which students and faculty can measure progress towards achieving. Instructors should reflect on whether the learning goals are relevant to students of all backgrounds and if not, why. Use active learning methods, whether problem-centered learning, team-based learning, or one of the many other theoretically informed and empirically tested engagement methods. 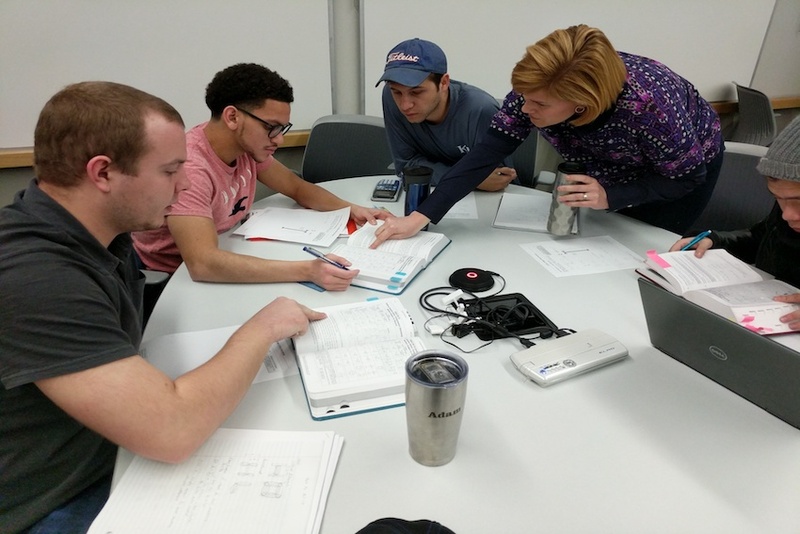 CTE provides numerous opportunities for learning about active learning in a wide array of university settings. Take advantage of high-impact practices, such as using collaborative assignments and projects, teaching a writing-intensive course or course module, engaging students in original research, building in opportunities for service learning and/or community-based learning, and provide opportunities to link learning between courses (e.g. developing an e-portfolio) and between the classroom and work or internship experiences. Scaffold assignments such that assignments are broken up into pieces that build cumulatively over the course of the semester. Scaffolding assignments also provides students with opportunities to receive feedback, revise their work based on the feedback, and synthesize multiple assignments into a final product worthy of showing to a potential employer. For all tasks students are asked to complete – in-class exercises and out-of-class assignments – be able to clearly articulate how the task(s) are relevant to the learning goals and objectives of the class. If the relevance cannot be clearly explained, consider why it is being asked of students. For assignments and exams, are instructions clearly worded and accessible to students from all backgrounds, including students with English as a non-native language? Are students provided rubrics that make expectations and grading criteria clear? Are examples of previous students’ work available to serve as models? Do assignments engage students with real-world applications that will be broadly relevant and interesting? Do the assignments provide students opportunities to apply their own cultures, identities, and backgrounds? Consider who is represented in the readings in terms of topics covered. Is there a reason why one group or another is not represented or represented frequently? Whenever possible, include multiple perspectives on each topic. Additionally, include materials written and created by people from different perspectives, rather than allowing one author or creator of materials to summarize all perspectives. Consider who is represented in the readings in terms of authors. Is there a reason why one group or another is not represented or represented frequently? When covering a theory or research by a member of a marginalized group, explicitly state this information and perhaps even show an image of the person; students in the same group benefit from seeing examples they can clearly identify with, just as in traditionally dominant groups do in their own lives. Do texts support deficit models that blame marginalized groups for the inequality they experience? Can asset-based reading and readings that address institutional and systemic discrimination replace or complement deficit model readings? Can course topics and content be adjusted to speak to diversity and inclusion? Can examples used to illustrate concepts, theories, or techniques also present a variety of identities, cultures, and worldviews? At KU, administrators, faculty, and staff are committed to the creation and maintenance of “inclusive learning” spaces. These are classrooms, labs, and other places of learning where you will be treated with respect and dignity and where all individuals are provided equitable opportunity to participate, contribute, and succeed. In [our classroom/insert course here], all students are welcome regardless of race/ethnicity, gender identities, gender expressions, sexual orientation, socio-economic status, age, disabilities, religion, regional background, Veteran status, citizenship status, nationality and other diverse identities that we each bring to class. Your success at KU and beyond is enhanced by the innovation and creativity of thought that inclusive classrooms facilitate. The success of an inclusive classroom relies on the participation, support, and understanding of you and your peers. We encourage you to speak up and share your views, but also understand that you are doing so in a learning environment in which we all are expected to engage respectfully and with regard to the dignity of all others. If you have any questions or concerns do not hesitate to raise them in class or with me directly. For a PDF file of the information on this webpage, please click here to download.